The Solids European Series entails 6 trade shows focusing purely on the bulk and solids industry. Held at 6 different locations across Europe the Solids European Series gathers in total 1,100 exhibitors and welcomes more than 14,000 visitors. Russell Finex, manufacturer of industrial separation equipment including vibratory sieves and separators, are a regular exhibitor at these Solids trade shows. Participating in almost every show of the Solids European Series, this edition held in Rotterdam, Netherlands is the third one this year. At Solids Rotterdam networking and presentation of latest innovations are considered key. New developments and products are shown in the field of dosing, weighing and measuring devices, machine and plant construction, separators, strainers, filters and handling. Personal contact and networking are emphasized through network opportunities such as breakfast meetings, workshops and seminars. At Solids Rotterdam 2015 Russell Finex will showcase a variety of their high quality check-screeners including the Russell Compact Airlock Sieve™, the Finex 22™ and the Finex Separator™. Each of these machines have their own features making them suitable for specific screening applications. 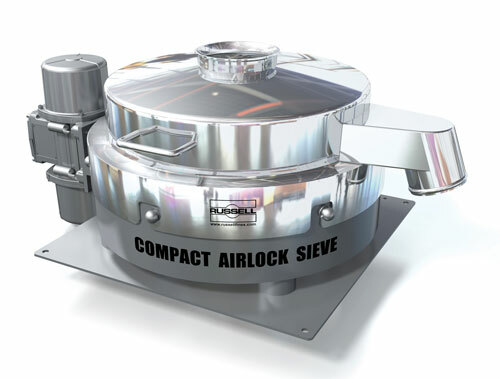 The Russell Compact Airlock Sieve™ is a vibratory sifter with a low height, enabling it to be easily installed in (existing) production lines where headroom is limited. This vibratory screener is known for its high product containment and can offer an OEL 5 containment (less than 1µg/m³). This is the first vibratory sifter which does not use traditional clamping methods such as quick release clamps. Instead it incorporates a patented TLI (Twist, Lock and Inflate) pneumatic clamping system. The TLI-clamping system works by placing and locating the sieve deck’s components into the base and locking them by twisting. Once the sieve deck has been locked, the seal is inflated, ensuring a dust tight seal. Due to the high product containment provided, the Russell Compact Airlock Sieve™ is suited to screen harmful powders and granules to prevent product contact and protect the health of employees. At Solids, Russell Finex will showcase a 900mm Russell Compact Airlock Sieve™, which is a new model size recently added to the range. Watch this animation and discover how this machine works. The Finex 22™ is a powerful vibrating screen to process both liquids and powders. This vibrating screener is a mobile unit and therefore can easily be used in different locations of the factory. Tool-free assembly and dis-assembly ensure minimum time is required to clean the machine, making it suitable for both continuous or batch operations. The Finex 22™ is also available in a high speed model to screen difficult powders or viscose liquids. The Finex Separator™ is a vibratory separator which will be displayed on the stand in operation with the Russell Gated Outlet™. The Finex Separator™ is the ideal multi-deck grading sieve to grade wet and dry products in up to five fractions. This machine is known for its high accuracy and high capacity. The Russell Gated Outlet™ is an innovative solution to control product flow and oversize discharge ideal for products with little oversize or when discharge happens too fast, resulting in wastage of good product. A pneumatically controlled gate is integrated in the outlet of the sieve deck to prevent the product from leaving the mesh for discharge too early. Visit Russell Finex at Solids Rotterdam in Hall 5, Stand B119 and discover more about these machines and other products ranges. On the stand expertise and know-how of Russell Finex engineers will be at your disposal to help you with your screening application or separation requirements.